Biomedical research is one of the most important areas of animal testing and rightly so, given that it is focused on improving human health and medicine. There are different types of biomedical research, which includes basic research and applied research. Basic research is important because it involves the study of how organisms function and develop. The learning associated with basic research is intricately linked to applied, or practical research although it is more academic in nature. Still, applied research is the type of biomedical research that is more actively relevant to medical advances. Therefore, the focus will be to look at how applied biomedical research occurs in terms of animal testing and how it relates to human health. 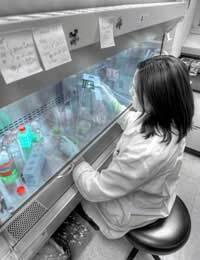 Applied biomedical research is focused on obtaining answers to detailed problems that are faced in medicine and health. This kind of research is largely performed in the pharmaceutical industry or contracted out through universities. Drugs may be developed through animal testing to treat human or veterinary health conditions. An important area of biomedical research is genetics, where the use of animal testing helps researchers to study numerous diseases. Animals will have a certain gene changed, added or removed to artificially create a specific disorder. This allows researchers to manipulate other variables or develop potential drugs to treat the condition. Another important area within genetics is diabetes. Researchers will use animal testing to obtain clues to how the disease develops in the body. The genetic aspect of diabetes is a vital one because any clues could impact huge numbers of sufferers with the condition. Yet another crucial area within genetics is cancer, where scientists are looking at mice that carry some of the same mutations that humans carry - all linked to the development of cancer. Animal-models are important and unfortunately, can't be substituted with non-animal models such as cell cultures because researchers need to examine the entire organism. By analysing animal models, scientists can learn what causes disease as well as how it develops and what aspects of genetics, the environment or diet contribute to the development of disease. For biomedical research in the area of genetics, many different types of animals are used, but mice are a common animal model. Other ones used include rats, pigs and sheep. Less frequently, birds and fish are used. There are many diseases that occur in both animals and humans. Some of the lifestyle factors that predispose an animal to disease are the same ones that predispose humans to the disease. For example, overweight cats are thought to be more likely to develop Type 2 diabetes. The same is true for humans who are overweight; they too are predisposed to developing Type 2 diabetes. Similar to humans, some dog breeds have narcolepsy, which means that dogs are an important model for studying the condition. Drug testing is another area of biomedical research that utilises animal testing. How drugs are metabolised - including their absorption, how they affect other body systems and how they are excreted - is vital to ensuring the safety of medications. Toxicology testing is also related to biomedical research. When drugs are being developed, their safety and efficacy needs to be ensured. They also need to be examined for the potential to cause tumour growth or negatively affect reproductive functioning. Some of the most important drugs and treatments that we use today are based on animal testing. Insulin, vaccines, antibiotics and numerous cancer and HIV treatments were developed through the use of animals in research. The public overwhelmingly supports biomedical research in the United Kingdom (UK) with recent surveys citing more than three quarters of the general public in support of this type of testing. Conversely, most of the public does not support cosmetics testing on animals. In terms of human health and medicine, however, the public is in favour of animal models. The belief is that animal use must be regulated and suffering minimised but that their use is justified in terms of improving health outcomes for humans. Still, animal welfare groups argue that non-animal models should be used instead. While these non-animal models do provide success in some cases, they are simply not equivalent to a whole organism and thus, are not widely accepted as a substitute that is effective for all experimentation. The future does look bright with regards to biomedical advances. It is hoped that animal testing continues to be strictly observed and regulated, such that biomedical research can yield new treatments and offer hope to those who suffer from debilitating diseases. Aids and HIV drugs were all created using animals along with insulin, methods to do organ transplants and more. This research probably saved the lives of your loved one. You are all ignorant. Animals don't deserve to be hurt. They help us humans enough by just being companions. I'm currently writing an essay on Why animals shouldn't be used for medical testing and the things I'm finding out are terrible. They shouldn't get hurt cause they're my creations. Animals shouldn't be hurt cause I'll get mad.